Angostura Bitters: sits at a lovely 44.7% abv and calls Trinidad and Tobago its “new” home. The ingredients are a closely guarded secret by the House of Angostura but they let us know it includes water, booze, and some herbs and spices. Yay. Originally developed by Dr. Johann Siegert in Venezuela he started making a profit selling the stomach aid and five years after his death in 1875 the plant was moved to Trinidad where it is still producing bitters today. The most Ango in the world is sold in Door County, Wisconsin at a bar called Nelsen’s Hall-- by the shot! Peychaud’s Bitters: came to be around the start of the 20th Century made by a French chemist named Antoine Peychaud. He moved from what is present day Haiti to Nawlins, Louisiana in 1795 and set up an apothecary shop selling booze bitters. His aromatic bitters are lighter and sweeter in taste to Angostura but very flowery with a strong gentian base with a touch of anise. Rumor has it that Antoine would have people up to his shop and he would make them small bitters spiked brandy drinks in egg cups called coquetiers. Sounds like a cocktail huh? Anyways, the drink caught on and was soon being made at the Merchants Exchange Coffee House in NOLA. The brand of Cognac was called Sazerac de Forge et Fils and when Phylloxera wiped out the Ugni Blanc grapes in France it created a huge shortage for the Coffee House. At this point, Thomas Handy was in charge of the bar and switched the recipe from Cognac to Rye and the rest is history. These bitters are now made by the New Orleans based Sazerac Company and the cocktail has kept the same name. Let the good times roll. Regans Orange #6: The infallible Gary “Gaz” Regan is responsible for these orange bitters that you can find on any bar shelf in the country and hopefully soon your own. Gary tends to exaggerate stories but these are apparently his sixth attempt at a recipe from The Gentleman's Companion: An Exotic Drinking Book by Charles H. Baker Jr. Story goes, numbers 1-4 tasted pretty vile and #5 was too good for the Tax and Trade Bureau to deem them Non-Potable thus unable to go to market. #6 was right on the money and Sazerac teamed up with Gary to put these guys on the market. Indispensable in a martini or an old fashioned. So those are the key players. You of course can pick up coffee bitters, lemon bitters, fruit cake bitters, cucumber bitters, cherry vanilla bark bitters, bitter old ladies, and old VW Bug bitters, etc. Those bitters usually have a place in one specific drink or to liven up a gin and soda. I do not consider my home a desert island but for making cocktails at your house...these are the only three you need. 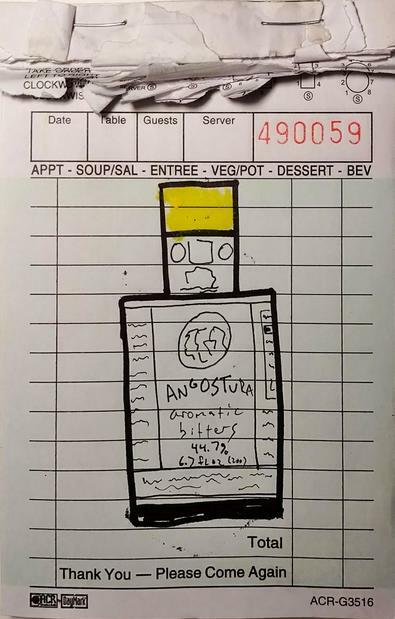 If you can only grab one, make sure it is Angostura. Also I would recommend bottling a little bit of Ango and carrying it with you on vacation. I have had trouble finding them out of the country unless I am near a major city with a cocktail scene.